For centuries, mute swans were known as 'birds royal' because only the king or a few specially favoured subjects could keep them. They were often served up, roasted, at banquets - a roast swan must have required a very large plate! Distribution: found throughout England, Wales and Ireland. Also in a few areas across northern Europe, eastwards to Mongolia. Introduced to North America, South Africa, Australia and New Zealand. Habitat: large freshwater areas, such as rivers, lakes and canals. Also estuaries, especially in winter. Description: adults all white; young are grey to begin with, and develop brown feathers which they keep until their second year. Reddish-orange bill, with a black knob of skin at the base. Size: length:- 1.5m. Wingspan:- 2.25m. Weight:- male, 10kg, female, 8kg. Life-span: most swans do not live more than 7 years in the wild. They can live up to 50 years. Food: underwater plants, grasses and cereal crops. The graceful mute swan is Britain's largest bird and one of the heaviest flying birds in the world. 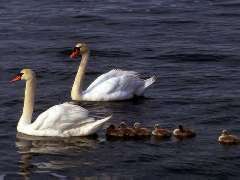 There are six other species of swan in the world, but the mute is the only resident one you will see in Britain i.e. it stays in Britain all the year round. During the winter months you may also see the whooper swan and Bewick's swan. Whooper swans visit the north and west of Britain in large numbers, arriving in the late autumn and remaining until the spring, when they fly on up to their breeding grounds in the Arctic. Bewick's swans come in from Siberia and occupy the eastern and southern parts of England. In some areas, both these visiting swans can be seen together. Large numbers gather together in three main groups; on the Derwent Floods in Yorkshire, the Ouse Washes of East Anglia and at Slimbridge in Gloucestershire. The mute swan is easy to distinguish from the whooper and Bewick's swans, but when the last two are seen together at a distance, it can be difficult to spot the difference between them. However, the whooper is larger than the Bewick's and has more yellow on the bill.